Scotiabank has announced Shannita Ramnarine as the winner of its Vision Achiever Programme 2018. Runner up Sherwin Bart of Your Waters received $500,000, the release said. He too was loud in praise for the initiative which sees small business owners receive training in vital aspects of entrepreneurship. 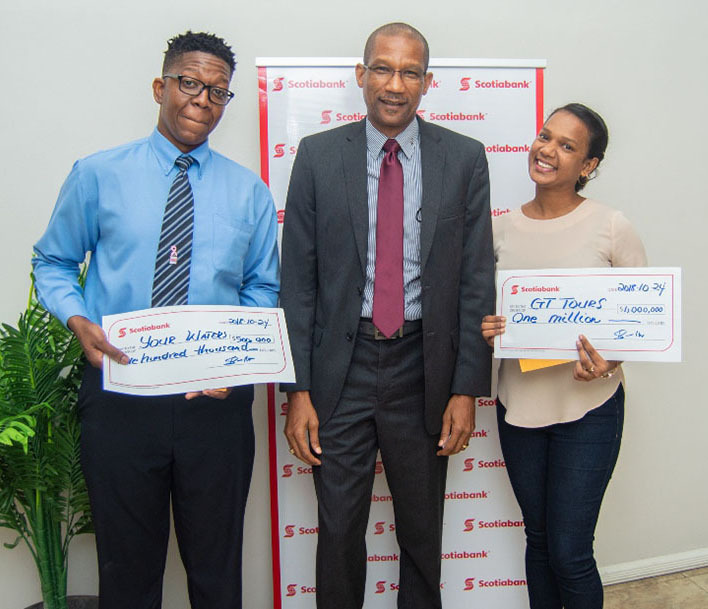 Country Manager of Scotiabank, Raymond Smith, in presenting the cheques to Shannita and Sherwin reiterated the bank’s commitment to small business development in Guyana and highlighted the range of solutions available that are specially tailored for small business operators. He also used the opportunity to tell the public that very soon Scotiabank will be rolling out the Visa Debit Card as well other new digital banking solutions. “We’re celebrating our 501 anniversary this year, and we remain committed to helping people in Guyana become better off”, he stated. Scotiabank’s Vision Achiever Programme began more than seven years ago. The release said that it is geared towards launching and expanding small businesses in Guyana. The other finalists were Natalya Thomas of Aone Events, Ruth Wilson of Soarers Video Production and Shemar Spencer of Swopp. All five finalists received business coaching from the world’s #1 business coaching firm, ActionCoach.